The changes introduced for the second EuroLeague Women Final Eight mean that every team is allowed one defeat without hurting their chances of qualifying for the semi-final. Last season only the winners from each group qualified for the final. Last year all the teams that lost on the opening day failed to qualify for the final. All this could imply that Bourges Basket, CCC Polkowice, Galatasaray MP and Famila Schio must win on day 2 to stay in the competition. Bourges Basket played Fenerbahçe SK in their opening game and came away with nothing despite keeping on level terms for the first 25 minutes. With a limited roster Bourges led (35-34) with just over 24 minutes played but failed to score another basket. During that time Fernerbahçe scored 28 points and put the match out of reach of the French Champions. Fernerbahçe won the game (69-44) with Angel McCoughtry and Ivana Matovic leading the way with 17 and 14 points each. However the shot of the game belonged to Cappie Pondexter from Fernerbahçe who hit a half-court buzzer beater to conclude the first quarter. For Bourges Basket Nwal-Endéné Miyem, playing with a face mask, scored 11 points and picked up 10 rebounds. As expected the host fans turned up in numbers to witness UMMC Ekaterinburg take on CCC Polkowice. It was not a clinical performance by the hosts despite dominating the first half of the game (35-22). CCC came storming back during the third quarter and trailed by just 4 points with 13 minutes to play (38-42). However this was as close CCC got. During the final 10 minutes Jacek Winnicki, the coach from CCC, withdrew his key players from the contest. 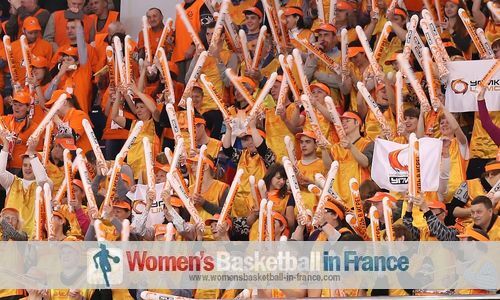 UMMC went to win by a comfortable margin (68-45) with Candace Parker scoring 17 points and picking up 13 rebounds. French international Sandrine Gruda scored 15 points. For 20 minutes Good Angels Kosice were on cloud 9 as they battered Galatasaray MP (46-16). They struggled in the second half but had enough points in the bank to hold on for an impressive victory (71-65). Sparta&K M. R. Vidnoje needed some inspiration from Seimone Augustus with a third-quarter ending buzzer beater and cool veteran play by Elisa Aguilar to hold off Famila Schio (88-79). The American duo of Seimone Augustus, Candice Dupree both had 18 points while French international Isabelle Yacoubou-Dehoui contributed 11 points in the victory. Jantel Lavender had a game high 32 points for Famila while French international Elodie Godin scored 6 points.